Last Saturday my newest book was launched, the Dutch ‘Wetenschappen in Beeld’, a 192-page comic book about science. It is the third book in the series of which ‘Philosophy: a Discovery in Comics’ is the first (the second is about religion). 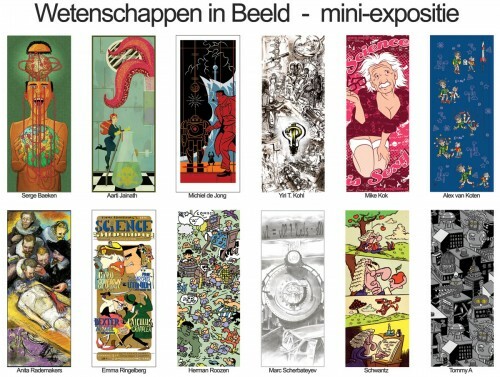 The presentation took place in comic store and gallery Lambiek in Amsterdam, and was framed by a mini-expo I organized with twelve fellow comic artists, who made amazing banners on the theme of ‘Comics and Science’. Ten of the twelve huge banners of the mini-expo (which was only “mini” because it was just there for a day). Click twice on the picture to see the twelve banners in more detail. VIP guest and speaker was “math-maiden” Ionica Smeets, who is a doctor in mathematics, science journalist and comics lover – she was so kind as to receive the symbolic first issue of the book. Ionica Smeets, me and Yiri before the crowds came in. But first, Klaas of Lambiek welcomed everyone and passed the book to my publisher, Esther van der Panne of Uitgeverij Meinema. Klaas Knol welcomes everyone to the party. Klaas passes the book to publisher Esther van der Panne. Esther van der Panne said a lot of kind words about the book and about Yiri and me – especially pointing to the wonderful coloring Yiri did on the book. …before passing it to Science Incarnated, Ionica Smeets, who held a delightful talk about her pet subject: mathematicians who died in freak accidents, or “fallen stars”, as she called them. And that’s when the party really started! I signed books for about two hours, so I had not as much time to socialize as I had wanted to, but I still had a great time and enjoyed the presence of so many colleagues, fans and family members! Hello! I own an Indie Publishing Comic company called Fallen Manga Studios. I am the writer and I have teamed with artists from around the Globe to create 6 different stories in the Comic/Manga Medium. (Nephlim, Dhampyr, Pantheon, Rise of the God Slayer, Death Sin, and M.R.P.) I have been trying to find a way to release my comics through an APP for months and I would like to know how you got yours onto Comixology. Ive emailed and tried everything I can think of but to no luck I cant figure out how to get my series onto it. Any help would be appreciated!